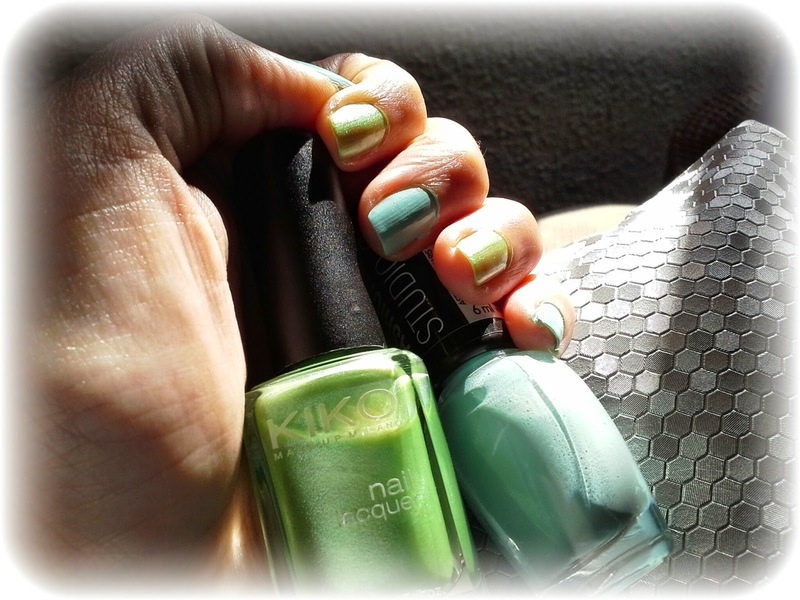 Here's my experience with two nail polishes: 242 Aqua Leaf by Astor Fashion Studio and 268 by Kiko. Mavala nail hardener + 2 coats of nail polish (3 coats of the 268). No top coat. It's a blue pastel nail polish. As it happens with most nail polishes, you need to apply two coats. It recedes a little bit on the tip of the nails once the nail polish is dry and I saw a small chip on the nail of my left thumb on the sixth day. It is good to swipe the brush horizontally on the tip of the nails when painting them since this nail polish tends to recede a bit once it's dry. Like other Astor Fashion Studio nail polishes, the formula is quite dense so make sure you take the excess off before applying the nail polish or you'll get stripe marks on your nails. I love this color and I think it's ideal for spring and summer time. It's a fair green nail polish with shiny microparticles in it that give a perly effect. I had to apply 3 coats of this nail polish to get the nail completely opaque. It's been already 7 days since i painted my nails and it hasn't chipped at all. You don't need to apply a top coat over this nail polish. I think you could also apply it over another color to give your nails a lovely pearly effect with a tad of green color. I love this color and I also find it ideal for spring and summer time. NOTES: I haven't seen it again in the shop, but it seems it's still available on the web.